HERMISTON, Oregon – Tyrone Wayne Ryder Jr., 28, of Hermiston was pulled over after crossing West Hermiston Avenue late Sunday night for not having proper lighting on his bicycle. By the time the city ordinance violation was complete, Ryder found himself facing serious felony charges. Hermiston Police Chief Jason Edmiston said Ryder provided a false name to the officer because he knew there was a felony warrant for his arrest. 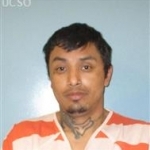 When his identity was confirmed by Umatilla County Emergency Dispatch, Edmiston said the suspect was taken into custody without incident. Because he was due to be incarcerated, police performed an inventory search for weapons and means of escape prior to being placed in the patrol vehicle. The officer consulted with a deputy district attorney and the decision was made to seize the money as evidence as well as the meth. In addition to the felony warrant, Ryder is now charged with felony delivery and felony possession of methamphetamine as well as giving false information to law enforcement. His bail is currently set at $65,000.